Ezekiel and his court meet the Saviors for their regular pickup. In addition to their normal goods, Jared wants Richard’s gun. Everyone is tense, and everyone draws weapons. Ezekiel makes Richard hand over his weapon. He curses Jared and Jared tries to strike him. Morgan blocks it with his staff and a scuffle breaks out. Gavin and Ezekiel calm down their individual groups and Gavin warns that things may need to get a little “visceral.” The Savoirs leave – with Morgan’s stick. Back at the Kingdom, Ezekiel promises he and Richard will talk later. Daryl asks where they went, and Morgan takes him aside. Daryl knows they went to speak to the Saviors and is offended. 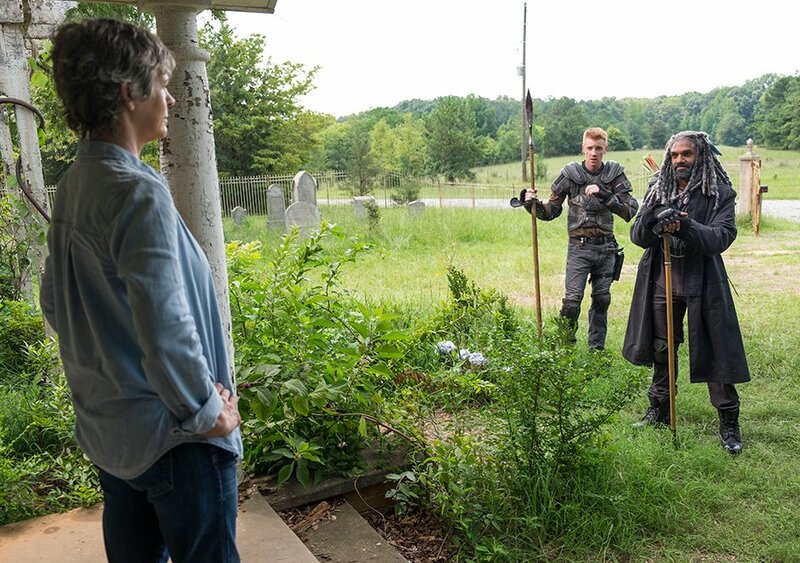 “If Carol were here, if she saw that, if she knew about Glenn and Abraham, she would kill them all.” Morgan agrees – and explains that is why she left. Daryl finds Richard practicing his archery and Richard asks for his help. He leads Daryl out to his secret camper in the woods, where he has weapons and Molotov cocktails stashed. Loaded up with weapons, Richard takes Daryl out to the road, one that the Saviors take frequently. He needs Daryl’s help in killing them – he can’t take them alone. In order to force Ezekiel’s hand, he is going to lead the Saviors right to the Hilltop, and to someone Ezekiel cares for. The plan is to kill the Saviors, make a big mess, lots of fire, and lead a trail of evidence to a little cabin just outside the Kingdom. Sure, the Saviors might kill the woman who lives there, but it would force the Kingdom into the fight. Daryl’s eyes cloud over and he listens to Richard insist that this woman has more balls than the two of them combined, she might live. Daryl demands to know her name. When Richard finally spills – “Carol” – Daryl is out. The Saviors are coming, and Daryl tackles Richard to prevent him from starting war. Richard reasons that Carol, living on her own, she may as well be dead. Daryl vows to kill him if anything happens to Carol. Daryl stays for dinner and Carol explains why she had to leave. “I couldn’t lose any of them; I couldn’t lose you,” she explains. If anyone she loved was hurt, she would have to kill them, and then there wouldn’t be anything left of Carol after that. She asks tentatively if the Saviors came back. “Yeah.” She is fearful, tears streaming down her face, but she asks if anyone got hurt. Daryl pauses. Then: “They came. We got them all, made a deal with the rest of them. Everyone’s all right.” Carol can barely contain her relief. She serves him dinner, too happy to eat. Daryl shovels down the food, as if trying to eat his emotions. 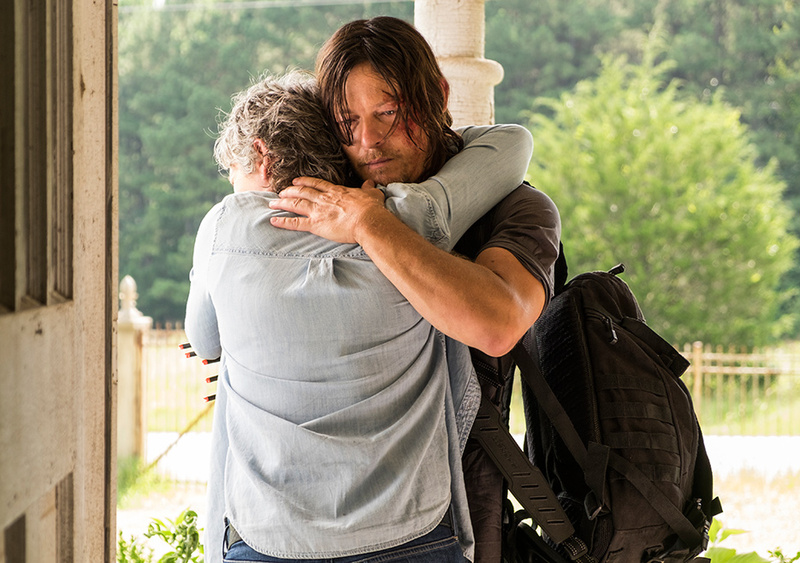 After dinner, Daryl leaves, but not before giving Carol a fierce hug. He doesn’t try to bring her back; he just tells her to watch out for herself. Morgan finds Daryl sitting with Shiva, who is kept in a cage when not sitting beside Ezekiel. He is impressed by how much Shiva seems to like Daryl. Daryl admits he found Carol, and he isn’t mad Morgan didn’t tell him. But they need the Kingdom to help in the fight against the Saviors. Morgan refuses to take part, and Daryl points out that whatever he is holding on to, it’s already gone. Morgan knows that Daryl didn’t tell Carol about Glenn or Abraham, otherwise she would be there, ready to kill. Morgan is glad to see that Daryl is also holding onto something. In the morning, Daryl goes back to the Hilltop. Meanwhile, Rick’s group has been taken by an interesting group, led by a woman named Jadis. They live in the center of a labyrinth made up of junkyard debris. The group is almost cult-like in the way they lead Rick’s crew into the center, and form concentric rings around them. Jadis has a primitive way of speaking, like she has devolved. Jadis believes they own Rick’s people and offer to sell their lives back to them. Rick points out the Saviors already own them and if they kill Rick’s group, they are going to have to deal with the Saviors. He wants to see Gabriel before they talk. Gabriel is brought out, scared but alive. Rick offers them a way out: join them, fight with them against the Saviors. Jadis says no and signals for Gabriel to be removed. The team starts fighting and Gabriel stands up, holding a knife to Tamiel’s throat. Gabriel follows up on Rick’s promise, that once they bring the Saviors down, they will be rewarded. Jadis wants something now. Jadis takes Rick to the top of one of the junk piles. Rick takes in the world around him in an embarrassingly bad matte shot. 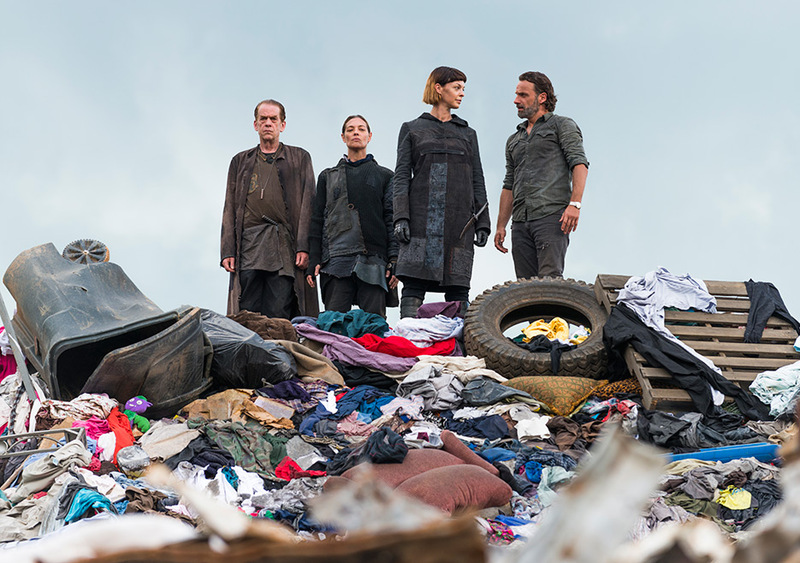 Jadis throws Rick off the trash heap. Michonne rushes to him, but is separated by a thick wall of garbage. Through a porthole, Rick assures Michonne he is fine… but then he hears a growl. 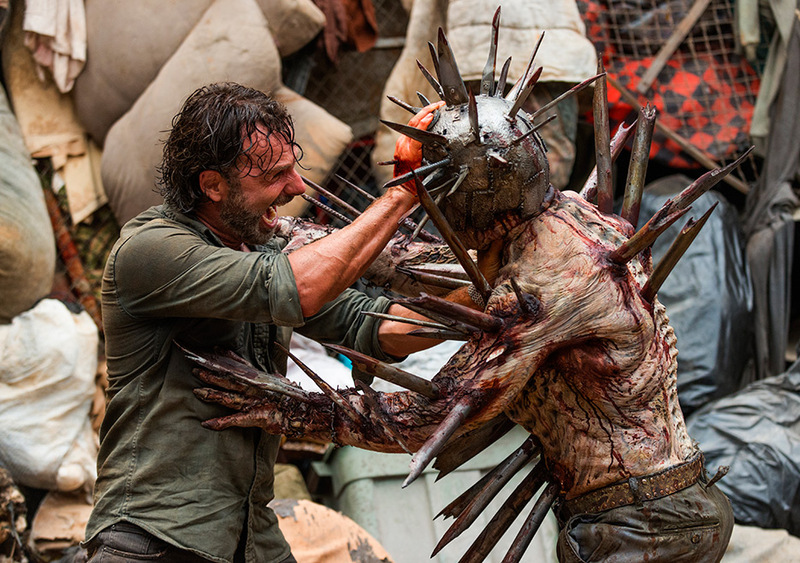 An insane walker, blind and covered in spikes, like a makeshift porcupine stumbles after Rick. Rick trips over the bones of those who fell before him. He tries to fight the zombie, but only succeeds in cutting open his leg and impaling his hand on one of the spikes. He tries to climb out of the pit, only to slide right back down. Michonne yells to him to “use the walls.” Rick manages to bring the walls down on top of the zombie, burying him beneath the refuse. Then Rick manages to kill him with a thick shard of glass. “Believe us now?” he calls up to Jadis. “Tell us what you want and we’ll get it.” Jadis drops a rope down so Rick can get out. Rick returns to his group, bloody and limping but proud of the deal they struck. Gabriel explains himself to Rick. That night, he heard something and went to check the pantry. That is when he was jumped, and Jadis (or her crew) forced him to collect everything. Gabriel was losing faith, but when he saw Rick, he knew they had come looking for him. His faith has been restored. You can watch previews for the next episode by clicking here.